A common feature of fire extinguishers filled with clean water and/or additives and backpacks for forest firefighting is the simplicity and reliability of their use. These products are equipped with special nozzles for water and/or foam, which enables an excellent efficacy and easy fire extinguisher stream control. Fire extinguishers with extinguishing water-based agents are intended for initial fire extinguishing involving flammable liquids and solids (foam extinguishers) or just initial fires involving solids (water extinguishers). A fire extinguisher for initial fire extinguishing filled with 15l of water or a mixture of foam and water. 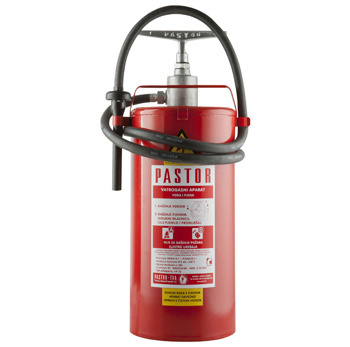 The fire extinguisher consists of a container with cover, connecting pipe with hand pump, at the end of which, where applicable, can be installed a foam nozzle (comes with the extinguisher) instead of water nozzle. The container is made of fine galvanised sheet, which is protected from the outside with RAL3000 coating, which forms a protective coating enabling a long life time of a container, no matter the storing conditions. The main parts of the pump are made of aluminium, which enables high quality and long-term use. Application: VP15 fire extinguisher is primarily intended for localizing and extinguishing small forest fires, and is most often used for fire brigade training, various firefighting competitions etc. IMPORTANT! Not for fire extinguishing of electrical appliances. 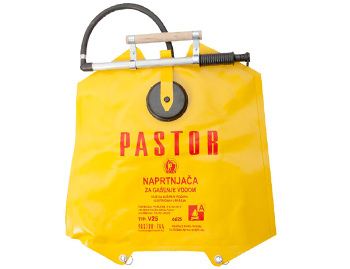 A backpack for initial fire extinguishing filled with 25l of water. Application: The backpack for initial fire extinguishing is primarily intended for localization and extinguishing of small forest fires with a full or dispersed jet, and also for extinguishing initial fires involving solids (class A).